Ryerson’s Aero Design (RAD) team flew into the top 10 during the Society of Automotive Engineers’ (SAE) Aero Design Series in Texas. RAD placed eighth out of 34 teams in the competition. The Aero Design Series consists of aircraft taking part in a heavy lifting competition. This year, the competition had a new rule. “Our vehicle had to carry tennis balls as passengers and weight as luggage,” said fourth-year aerospace engineering student, Ryan Long. RAD’s plane was named Wilson after the brand of tennis balls the team had to buy. Wilson was able to carry 34 balls. The engineering design team was started in 1986, making it one of Ryerson’s oldest clubs. It consists of at least 40 students, with the majority from Ryerson’s aerospace engineering program. In the competition, aircraft were separated into three different categories, including micro, average and advanced classes, with each stream focusing on carrying as much payload as possible while flying a circuit of the flying field. Each year, Ryerson’s team aims to build two planes, one for the micro class and the other for the average division. This year, RAD’s team behind the micro class plane had the opportunity to experiment with new manufacturing processes to create a carbon fiber wing and tail structure. “Designing the plane really helps some of the students on our team learn about manufacturing processes. That is something that is really big in the industry right now and very valuable to employers as well,” said Long. A large part of the micro class is having “a really compact design and assembly,” said Dylan Krcmarov, a Ryerson aerospace engineering student. RAD’s plane ended up being six inches in diameter and eight inches tall. 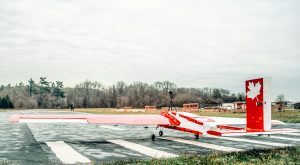 RAD tests their plane in Stouffville, Ont. near the town’s airport because their planes need plenty of space to fly; Wilson has a four-metre wingspan and can go about 60 km/h. Long said the team is confident that their success will continue next year.